Split chicken breasts were on sale at Whole Foods this past week, so I couldn’t resist the chance to make some more low and slow roasted chicken (because that Herb Roasted Chicken Breast that I made was SO good). This time, though, I wanted to try a different, yet classic, flavor combo. 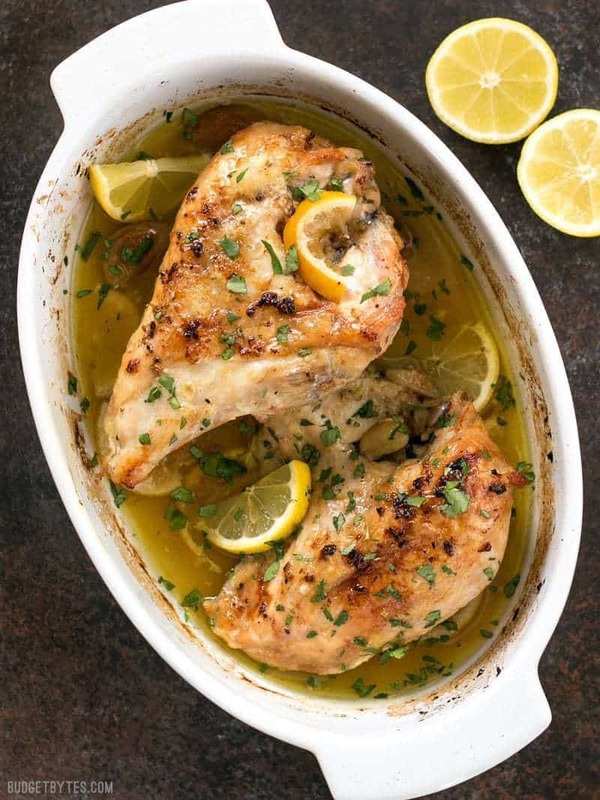 This Lemon Garlic Roasted Chicken is incredibly simple, but seriously scrumptious! Why Bake Chicken “Low and Slow”? This low and slow oven roasting technique creates a deliciously tender meat, similar to what you get with a rotisserie chicken. It also creates a delicious pan juice that I like to spoon over the meat after slicing for even more flavor and moisture. It’s just to die for. But be aware, this recipe is specifically for “split breasts” which means the breast has bones, skin, and rib meat intact. The only thing that has been done to this chicken breast is that it has been “split” into two pieces. Can I Use Boneless Chicken Breast? Boneless skinless breasts will not work the same way. You can potentially do other bone-in, skin on cuts of chicken, but the cooking time will be different because of the size of the pieces. I’ve only done this technique with split breasts so far, so that is the only cut that I can really provide correct cooking times and temperatures for. Once this chicken is roasted, I like to carve the meat from the bone, place it in a container, spoon the juices over top, and keep it on hand to use like rotisserie chicken. I use it to snack on, make quick wraps, or to add to salads. 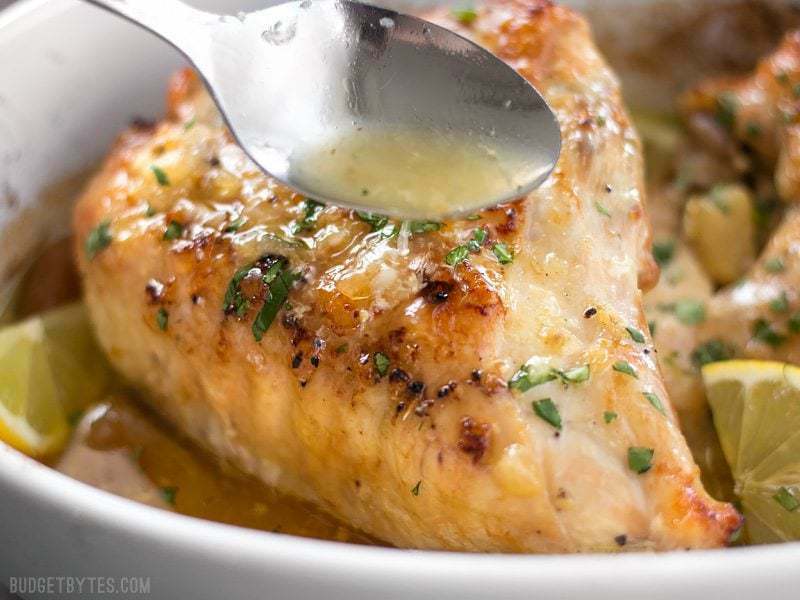 This low and slow cooking method makes this Lemon Garlic Roasted Chicken incredibly tender, juicy, and flavorful! Preheat the oven to 275ºF. Squeeze about 3 Tbsp lemon juice from the lemon(s) and slice the remainder. Mince two cloves of the garlic, and peel the remaining 4. 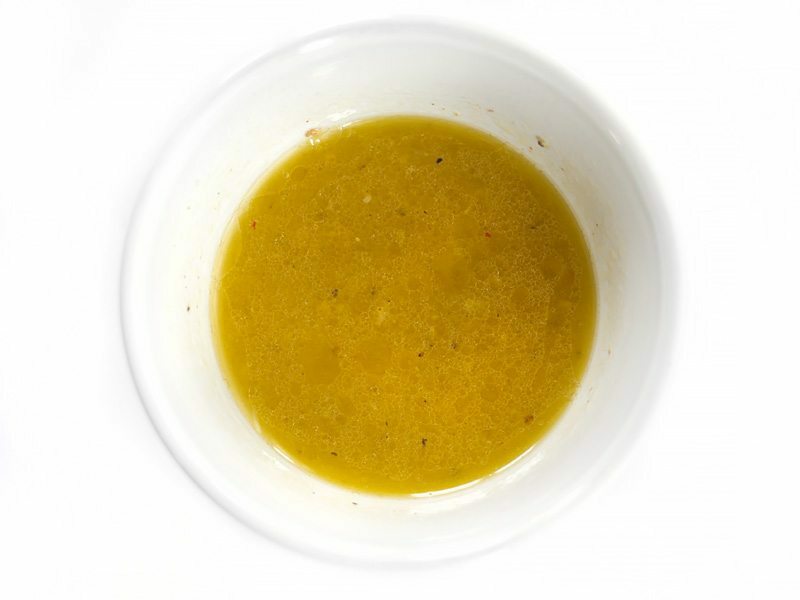 In a small bowl, whisk together the lemon juice, olive oil, minced garlic, salt, and pepper. Pat the chicken breasts dry with a paper towel. Place them in a glass or ceramic casserole dish. 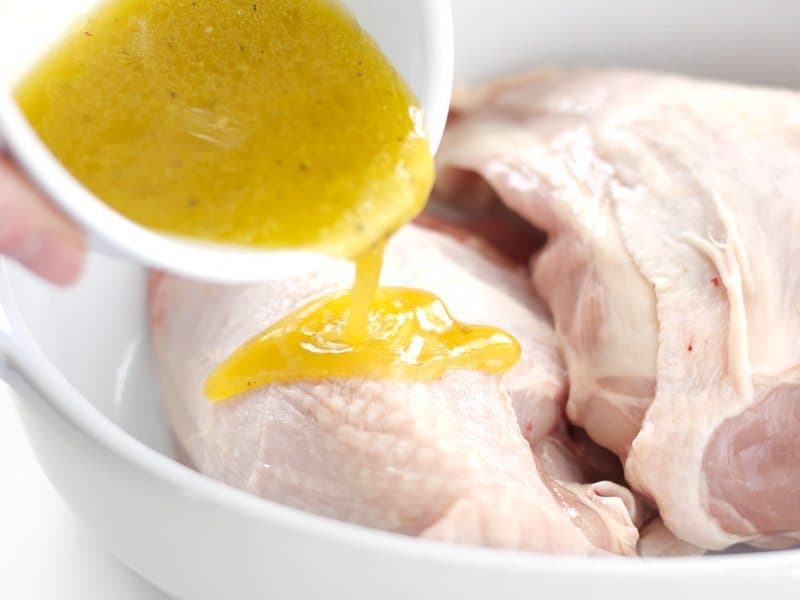 Pour the prepared lemon marinade over the chicken, using a spoon to redistribute the marinade and make sure the surface of the chicken is fully covered. 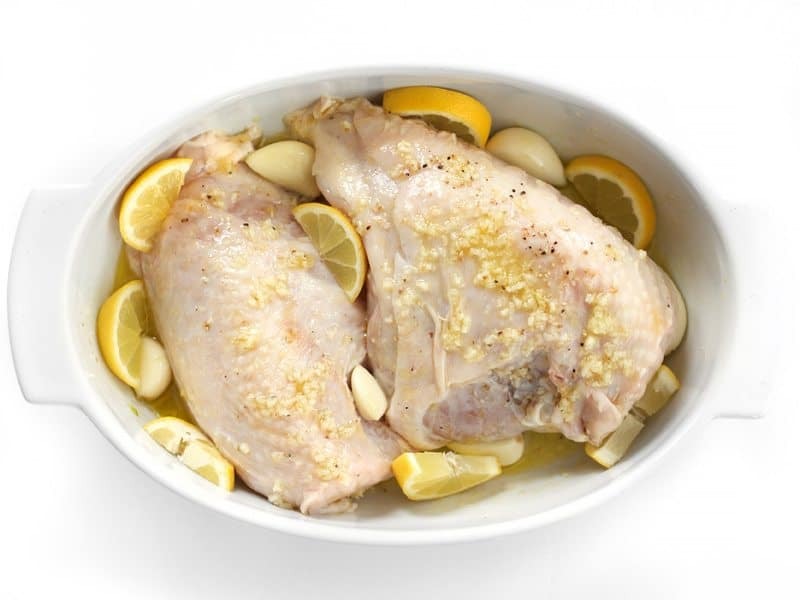 Add the remaining cloves of peeled garlic and sliced lemon around the chicken. If you're sensitive to bitter flavors, add the additional lemon slices after baking. Cover the dish tightly with foil. Roast the chicken in the preheated oven for 90 minutes. 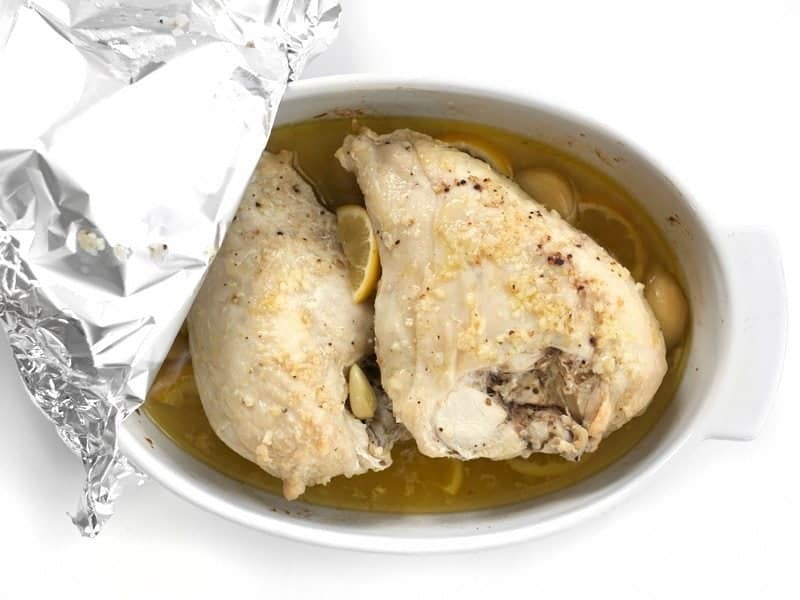 After 90 minutes, turn the oven up to 425ºF, remove the foil, and baste the chicken with the juices from the bottom of the dish. Return the chicken to the oven and roast for an additional 20 minutes without foil at 425ºF, or until the skin is golden brown and crispy. Let the chicken rest for 5-10 minutes before slicing. Serve warm with the pan drippings spooned over top. *Split chicken breasts are bone-in, skin-on, and rib meat attached. That crispy brown skin is TO DIE FOR! Begin by preheating the oven to 275ºF. Squeeze about 3 Tbsp of lemon juice from a small lemon or half of a large lemon, and slice the remaining lemon (I used two mini lemons, but you could use just one large lemon). Mince two cloves of garlic and peel four more, but leave them whole. In a small dish, whisk together the lemon juice, 1/3 cup olive oil, 2 minced cloves of garlic, 1/4 tsp salt, and some freshly cracked pepper. 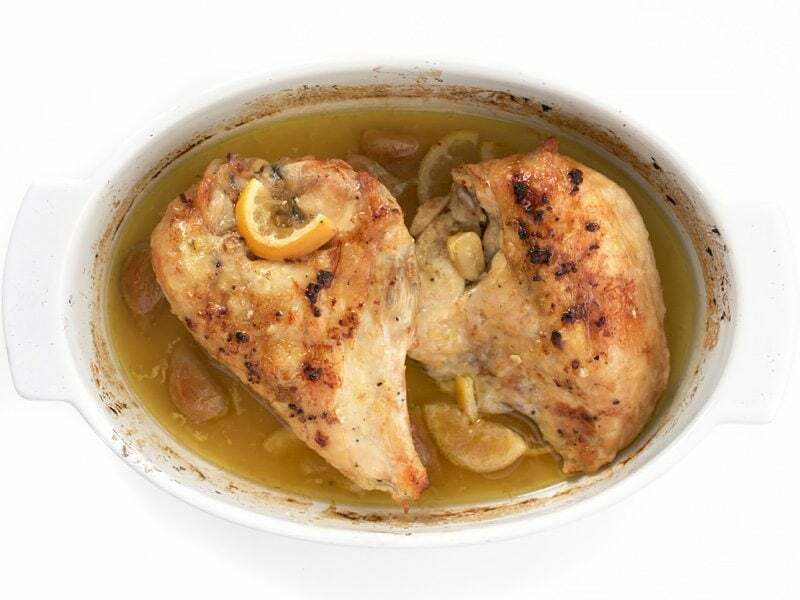 Place two split chicken breasts (split chicken breasts are skin-on, bone-in, and rib meat attached) in a ceramic or glass casserole dish. Pat the skin dry with a paper towel, then pour the marinade over top. Spoon excess marinade from the bottom of the dish over the chicken to make sure the surface is fully covered. 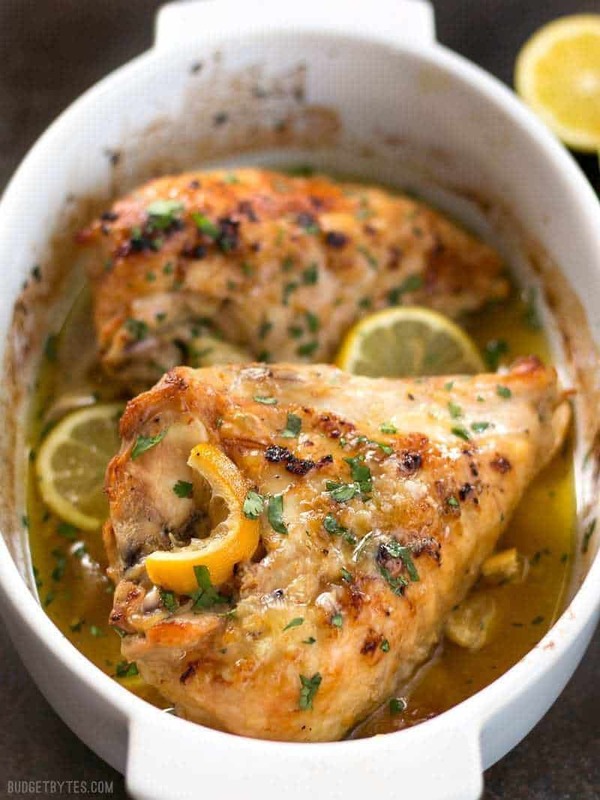 Place the remaining four cloves of peeled garlic and lemon slices around the chicken. If you’re sensitive to bitter flavors, you may want to just add the lemon slices after cooking. The white pith can have a bitter flavor, which some people like, but others can not tolerate. Roast for an additional 20 minutes at 425ºF without foil, or until the skin is golden brown and crispy. Let the chicken rest for 5-10 minutes before serving. Make sure to spoon some of that delicious liquid over the meat, too! I added a little chopped parsley to add color to the photos, but it’s not necessary for flavor. The little sweet and tender cloves of garlic are not to be forgotten! They are so incredibly delicious. We love this recipe, eating it weekly!! I will never go back to boneless chicken! I have been watching the chx grocery counter, and snag all the mark downs to freeze and save cash! Also, I have been making a lovely pan sauce. After pulling chx from oven, I pour drippings in a small skillet, add a little white wine, and reduce. Yummy!!! Thanks!! So simple, so delicious! Made this with bone in skinless thighs and baked uncovered 75 minutes at 350, came out great! 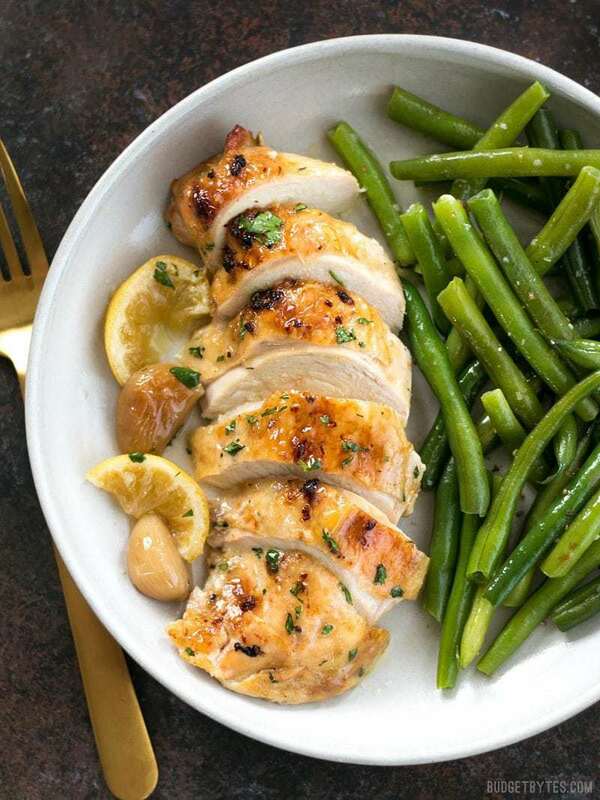 What would you recommend changing jfnwe were to roast 4 chicken breasts? This recipe does not work for boneless skinless breasts, so make sure you’re using bone-in skin on breasts like the recipe suggests. Boneless and/or skinless breasts will dry out if you use this cooking method. This was absolutely delicious! 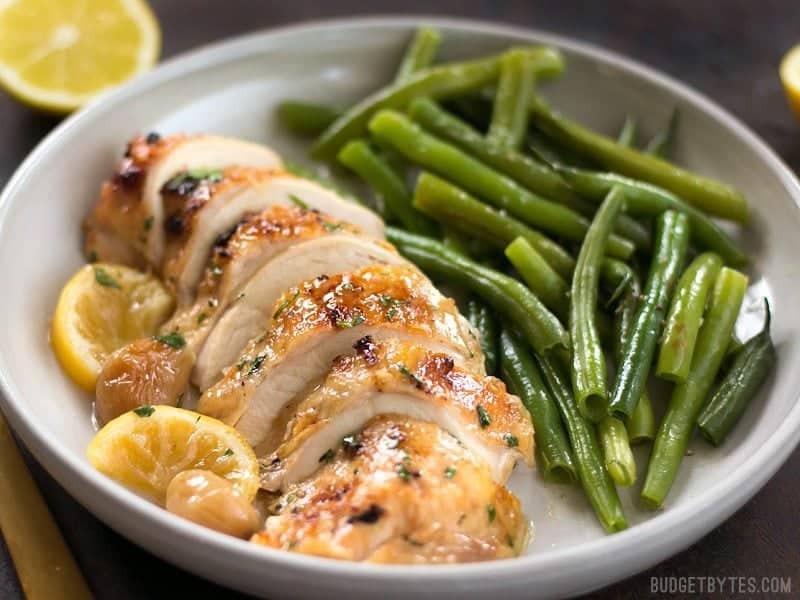 I have a hard time finding the split chicken breasts at the store, but is well worth the hunt! Unfortunately this one is not well suited for boneless, skinless chicken. The bones and skin are needed to keep the chicken moist and tender during the long roasting time. Can you use skin-on, bone-in thighs? They’re usually on sale by me. Thanks! I have to say, I was looking for something different to make tonight and I had all of these ingredients…and it is delicious! So do you take the chicken out of the oven while you wait for 425? Sorry that’s probably a silly question but I’m a terrible cook, but this looks like something I couldn’t mess up. Ha! So I am marinating this—but I have boneless chicken breasts–hope it works!! !